Sanya Kroitor’s artistic elegance, charismatic power and vivacious energy combined with his exceptional mastery of the violin technique and with the deep emotion coming from his compositions, make his music an extraordinary experience which delights all souls. According to Sanya Kroitor music is not just playing some musical scores. He makes sure the importance and role of each note are felt. His music – which is a mixture of jazz, folk, rock fusion, world music, and klezmer is the result of his compositions, both unique and fascinating. Sanya Kroitor only swears by work which makes him reach perfection and the technical mastery of his instrument. This work is as important to him as the emotion he gives through his music. As a result, improvisation has become so meaningful to Sanya’s artistic expression. Kroitor plunged into the universe of jazz and improvisation very young. 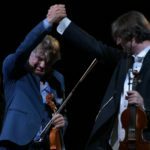 While listening to the most talented artists, he draws his inspiration from Stéphane Grappelli, Django Reinhard, Jean-Luc Ponty, and Didier Lockwood, with whom he has performed. He also fed on the traditional Jewish music Klezmer, which is part of his culture. Kroitor’s love for music was given to him as a child by his father Emile Kroitor – a well-known accordionist and composer. He started playing the violin when he was 7. When he was 10 he performed his first concerts as a soloist with the Moldavian Folkloric Band conducted by his father. To have a perfect mastery of his instrument, he attended a well-known Russian violin school: the Chisinau School in the Moldavian capital, taught by Joseph Nuzman, a former pupil of David Oistrakh and Isabelle Isma.